When we have friends who compete for power, we become drowned in the curiosity of what they would be like when they become large possessors of power like Prime Minister, President, Cabinet Ministers, etc. Take Nigel Hughes and Dr. David Hinds. I know both of them well, and have a fairly good idea of who they essentially are. It would be fascinating to see what they would be like in power. Nigel and David are not in power, and are not in electoral competition, so we may never see them in action. I had high hopes that my friend Khemraj Ramjattan would be one of the key transformers of Guyana’s Dostoyevskian existence. I don’t know David Granger at all. I never embraced the idea that he was one for the future. I thought that of Khemraj. Out of power, Khemraj reminded me of the Rodeneyite era where men and women with novel ideas would fundamentally change Guyana. Khemraj in office has proven to be a deep disappointment to me. I never had any expectations of Rupert Roopnaraine as a high state official. 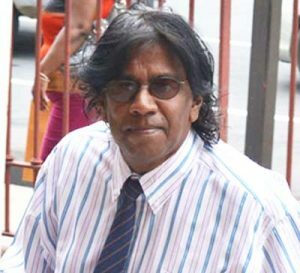 I knew Roopnaraine since 1974, and his political style didn’t allow me to think he came in the mould of Walter Rodney. Roopnaraine has ended his political life in painful ignominy. No one with such a huge contribution, and learned mind should have ended this way. My respect for his contribution is still there and for that reason I wish he didn’t become what he has become. Clive Thomas had an immeasurable influence of me. Of the fighters I admired who struggled to change Guyana after Burnham descended into autocracy; I would say after Walter Rodney, I put Clive Thomas. I was not as close to Walter as I was to Clive since we interacted on the UG campus and I knew Clive before Walter, when we functioned together in the Movement Against Oppression in Tiger Bay. I preferred Clive to Cheddi Jagan to succeed President Hoyte after the arrival of free and fair elections. In my heart, I felt Clive would be more open-minded, less racial and a more defined leader. I always had suspicion that Cheddi would not make a good leader and that Janet Jagan would lead him astray. That happened after 1992. When the APNU-AFC won the 2015 poll, I was eager to see what Nigel, Khemraj and Clive would do in government. I thought David Hinds would probably be the new UG Vice Chancellor. Nigel Hughes quit politics. Khemraj and Clive became huge disappointments. But Clive has faltered very badly. As Chairman of GuySuco, where is the Clive Thomas that helped to shape my praxis and politics? You put over six thousand parents of out employment and no alternative arrangement, then you cannot be right for this country. We come now to Moses Nagamootoo. More than Clive and Khemraj, this man has the authority to effect far-reaching changes; he is second in charge of Guyana but he comes across as a man who has absolutely no interest in using power for positive, transformational purposes. Moses Nagamootoo comes across as a Prime Minister who doesn’t mind being preoccupied with the trappings of office, but not the philosophy of office. He writes a weekly column in the Chronicle about changes but if he should “hang” or “lime” or even ground me with me for one day, he would see that Guyanese do not see a bright future with him as Prime Minister and do not think that their country has changed one bit with him as Prime Minister. He stopped his entourage (which he seems to be loving every moment, being part of) on Church Street, reminded me that he was my friend and I should call him. I asked why he doesn’t call me. He hasn’t up to now. With Moses as a friend, I don’t need enemies. His latest piece in the Chronicle about less time for getting a passport and the advent of the Procurement Commission and other small patatoes comes across as propaganda material. But what about six thousand sugar workers that he grew up with? Yes, sugar is no longer viable but why aren’t there alternative arrangements for these poor people? The banality of evil (term taken from the famous philosophy book of Hannah Arendt) is still with Guyana and its most horrific manifestation is what Guyana did to Jermaine Earle last Monday. He was sentenced to three years for HALF A GRAM of cocaine. Isn’t this the banality of evil? Not even in Malaysia, Thailand and the Philippines where drugs laws are more draconian that would have happened. Shame on you Moses!